Early this year, Facebook's founder Mark Zuckerberg made it known of his plans to merge Facebook Messenger, WhatsApp and Instagram as one unified messaging platform. Facebook said that the move was aimed at breaking down communication barriers among users of Messenger, WhatsApp and Instagram. While the social giant said that the infrastructure won't materialise until 2020, a recent discovery shows that Facebook is already testing the functionality in the main Facebook app. 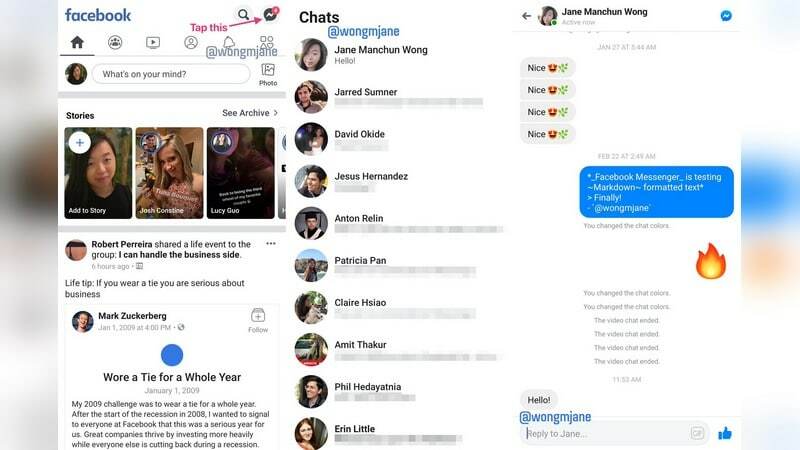 According to screenshots shared by renowned app reverse engineer, Jane Manchun Wong, Facebook is working on returning the Messenger chat feature back to the Facebook app to make possible the cross-connected vision of merging the Facebook family of apps. The screenshots shows a small Messenger icon at the top in the Facebook app. When you tap on the Messenger icon, the conversation feeds will open with the list of all contacts as it is in the main Messenger app. If the user wants to send a reaction, send a photo or make a voice call, they will have to use the Facebook Messenger app. Messenger was released in 2011 and was part of the Facebook app. However, the Messenger chat functionality was removed from the main Facebook app and then made a standalone app. Now, Facebook wants to bring back the Messenger chat functionality onto the main Facebook app in preparations for the unification of WhatsApp, Instagram and Facebook. This leak by Jane Wong shows that Facebook is really seriously making on making the integration happen. When it eventually does, users of the three Facebook-owned networks will locked in Facebooks ecosystem just as the way Apple users are.